Cisco’s exams can be a lot of hard work- we know. But the worst thing you can do to yourself is to simply look up the answers to exam questions. Not only do you not learn anything- but you’re hurting your future in the process. Instead, shouldn’t you get a helpful hint and get pointed in the right direction of where to look for an answer? That way, you can keep your dignity, hopes for the future, and of course your grade. 1. What is characteristic of the operation of a Layer 2 switch? Explanation: Like a bridge, the layer 2 switch will forward data based on the destination MAC address of the data. This data is then forwarded to a specific port, unlike hubs who would broadcast to all ports (and thus waste resources). D is the correct answer. A) A hub operates at Layer 2 of the OSI model. B) A hub reduces the number of collisions on a LAN. 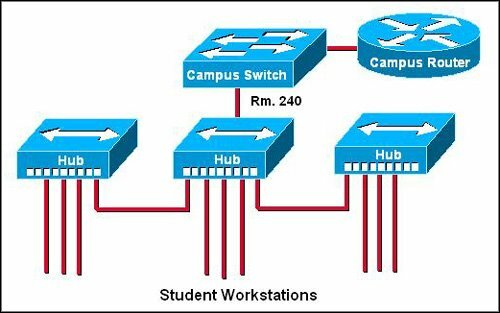 C) A hub works at a higher OSI model layer than a switch. E) A switch provides a collision-free environment on a LAN. F) The number of collisions on a LAN are the same whether a hub or a switch is used. Explanation: Switches use microsegmentation to provide more throughput, so D is correct. Switches also support full-duplex operation, which means a collision-free environment is possible- so E is also correct. 3. Refer to the exhibit. Forty-eight workstations are connected to a hub. The users are able to connect to the network, but access is very slow. An entry-level technician replaces the 10 Mbps hub with 100 Mbps hub but the problem still exists. What is the most economical way to correct the problem? A) Replace the hub with a switch. B) Replace the hub with a router. 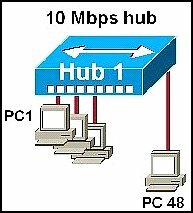 C) Replace the hub with a 1 Gbps hub. D) Replace the hub with a 10 Mbps fiber hub. Explanation: Although the hub was upgraded, it is still a hub. Switches are considered to be superior in providing bandwidth via microsegmentation and reliability via full-duplex operation. In this case, we will want to replace the hub with a switch- A is the correct answer. 4. Exhibited is a portion of ABC Company internetwork. Which of the connections can be full duplex? Explanation: Segment 1 is operating under a hub- and as we know, hubs aren’t capable of full-duplex capability. Therefore, all other segments except 1 may be full-duplex. D is the correct answer. 5. Refer to the exhibit. The switch and the hub have default configurations, and the switch has built its CAM table. Which of the hosts will receive the data when workstation A sends a unicast packet to workstation C? Explanation: Only workstation C will get the data, since we are using a switch. Switches use microsegmentation, which will allow only the receiving computer to get the data in this instance. A is the correct answer. 6. An administrator would like to connect ten workstations on a 192.168.0.0/24 network. The device selected by the administrator must allow connectivity between hosts without sharing bandwidth. Which device would be appropriate? Explanation: Only a switch can route data without sharing data. Note that the hub would be able to be used if sharing bandwidth wasn’t an issue. But since it is, C is the correct answer. Explanation: Bridges and switches both operate on the Data Link layer- meaning they do indeed deal with MAC addresses. B and D are the correct answers, since the rest of the answers operate on the physical layer. Explanation: Repeaters and hubs both extend the collision domain by repeating a signal, so B and E is correct. Bridges, routers, and switches create more collision domains- not extend them. Explanation: Switches, routers, and repeaters all create more collision domains when used correctly. C and D are correct. Hubs extend the collision domain, and NICs are unrelated. 10. Refer to the exhibit. How many broadcast domains exist in classroom 240? Explanation: Only 1 broadcast domain exists, since the multiple hubs only extend the domain, not create more collision domains. The switch effectively creates our only collision domain. A is the correct answer. 11. A PC receives a frame. Which situation will cause the NIC on the receiving host to pass the frame contents up the OSI layers to be processed by the PC? A) The frame is a runt frame. B) The destination MAC address of the frame is FFFF.FFFF.FFFF. C) The transmitting host generated a jam signal during the frame transmission. D) The recalculated checksum for the frame does not match the FCS on the frame. Explanation: We know that broadcasts are always expressed as the highest number possible. In hex, this number is actually F. Therefore, the NIC will process a broadcast that is defined by the MAC address FFFF.FFFF.FFFF, so B is the correct answer. 12. A network administrator has a multi-floor LAN to monitor and maintain. Through careful monitoring, the administrator has noticed a large amount of broadcast traffic slowing the network. Which device would you use to best solve this problem? Explanation: The best device would be the router. The hub would only cause bandwidth concerns, and the bridge would only divide the network into two halves- not provide any other functionality. Transceivers are unrelated. The correct answer is C.
13. What will a bridge do if it receives a frame with a MAC address that is not within the table? Explanation: If a frame is received that doesn’t have a MAC address, the frame is forwarded out of all ports except the source port. D is the correct answer. 14. Which networking device reduces the size of both collision domains and broadcast domains? Explanation: Since only a router can separate broadcast domains, C is the correct answer. 15. What is used to prevent Layer 2 switching loops? Explanation: Spanning tree protocol, or STP, is used to prevent switching loops. Have a look at the above article for more information. Not a bad LAN refresher, but what I would like to comment on is your statement in the beginning. Working as a network engineer, I often see people who have multiple certifications. However, many of them did just memorize answers to questions that they got from TestKing and similar places. You can always tell who they are by the glazed over look in their eyes when asked to configure a network device. Or, as I like to call it, “The deer in the headlight” look. They usually do not last long! Sadly, Micah, your statement is all too true. Luckily for the few of us who appreciate hard work (and more success as a result), we have resources like this to learn from (and not necessarily get the easy way out from). Where is the best place to get started in becoming a network engineer? I work all day so I would like to get started at night. Please advise. Thank you. Thank you Sir. The answers are well explained to understand easily. thanks for the practice im learning and studying for my ccna. I agree with Micah. 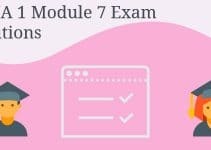 Best Site For student of CCNA. 1.How long will it take to transmit a 10MB file using a serial link with bit rate of 115200 bps? 2.How long will it take to transmit the 10MB file using USB 2.0 which operates at speeds of 480 Mbps? 3.Which layer generates segments? What are the main components of the header? 4.Explain how the data link layer is different in its encapsulation from that of other upper layers? very good knowledge for the beginner who have just come out from university and joining into the job market.. Very nice questions to face in the interview.. I Have doubts with 1st question. What about adres learning, how mac table is populated ? Shouldn’t the correct answer be C and D ?